Our hands-on testing and focus groups with parents revealed several swaddle blanket brands that make soft, flexible, and durable swaddling and receiving blankets. 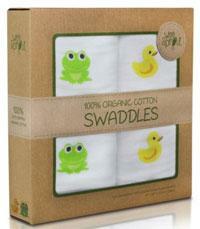 These include Aden + Anais, Swaddle Designs, Margaux & May, CuddleBug, ZigZag, Cozy Babe, and Wee Sprouts. After testing the blankets for over 6 months with 3 different families, we've come away with some pretty confident ratings and rankings that we hope will help you find the perfect option for you and your baby! Before starting our reviews of the best swaddling blankets of the year, we want to make a few observations. Over the course of the last few years, there has been a huge influx of small businesses (and some very large ones) making their own versions of Muslin Cotton swaddle blankets. Each company tends to have its own unique designs, with various patterns, illustrations, and colors. As the market is quickly becoming saturated with muslin cotton swaddling blankets, it has become increasingly difficult to differentiate them: which is the softest, which is the right size, which has the best patterns, which uses the best manufacturing controls, and which is organic? To be fair, most are really soft after a few washings, they are mostly about 46" to 48" square, and most are 100% natural muslin cotton (so soft! ), and most are *about* the same thickness. It's important to point out that most are also made in China, though some claim to use 100% organic cotton, though we are not completely confident in the controls used for verifying that fact. We are also getting concerned about quality control with the bright dyes being used by many companies, without any mention of how the dyes are sourced or what they might contain. With all that in mind, we've done our best to find you the best swaddle blankets made by the most reputable companies and brands on the baby products market. And we have done hands-on testing with all of them: wrapping babies, washing the blankets several times, and making sure they perform well not only the first time but also after repeated use. We also checked carefully for any rashes or irritation on the arms, neck, and legs, to make sure these blankets were not using any harsh and irritating chemicals in their production. This is our hands-on review of swaddling and receiving blankets. Be sure to also check out our reviews of the best swaddlers and sleep sacks. Here are the Best Swaddling Blankets of 2019! 2. Aden + Anais Muslin Swaddle Blankets. The Aden + Anais swaddle blankets come in two primary sizes, 44" x 44" and the larger "classic" 47" x 47" version. Most people prefer the larger size, so be sure that you're ordering the right ones; also, the word on the street is that the smaller ones are slightly thinner than the larger ones. In general, the Aden + Anais blankets receive fantastic reviews; they are warm yet lightweight, breathable, 100% cotton, and get softer with multiple washes. Moms report that they aren't the cutest blankets on the market (the designs are very subtle), but they do the best job swaddling, and are great for other uses as well (covering the car seat, breastfeeding cover, tummy time blanket, etc). The fabric is soft and has a tiny bit of stretch to it. In our testing, these blankets held up fantastic to repeated washings, without any apparent loss of quality. In fact, we found that they got consistently softer as you washed them more, which is a hallmark of the muslin cotton blankets. Overall, highly recommended! 3. 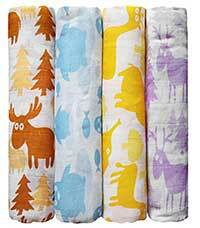 WeeSprout Muslin Swaddle Blankets. The WeeSprout are very similar to the Aden + Anais blankets, but they are made with 100% organic cotton, using a breathable, comfortable, soft, and flexible Muslin weave pattern. The great thing about Muslin cotton is that it actually gets softer as you wash it, rather than other fabrics and weave patterns that will get stiff, thin, and scratchy. Like all the swaddling blankets on this list, these can be used as an awesome 47" x 47" swaddling blanket, or as a nursing cover-up, play mat, burp cloth, stroller cover, tummy time blanket, and more! Another thing to note is that these WeeSprout blankets come in a nice looking box, so they can double as a great baby shower gift! The only downfall we found was that there are only a limited number of styles, so if you're not into rubber duckies or cute little frogs, then you're outta luck! 4. 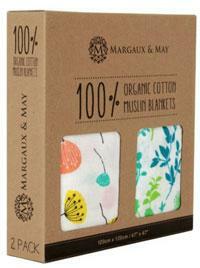 Margaux & May Muslin Swaddle Blankets. This was a toss-up between the #2 and #3 spots, and in both cases you're getting a super soft, super durable and comfortable swaddling blanket. They're both organic as well, so you don't need to worry about any harmful dyes, chemicals, or pesticides. In fact, they're also the same size (47" x 47"), both come in a cute box that makes for a great gift presentation, and we couldn't really tell them apart in terms of hand-feel. Both were breathable, soft, and flexible. And like the others, the more times through the washing machine, the softer it gets. There were only a couple small differences we could find between these and the WeeSprout. First, these were a tiny bit thicker, and second, these come in a few more patterns than the WeeSprout. The tie-breaker was really just those darn rubber duckies were so adorable we had to go with them! 5. 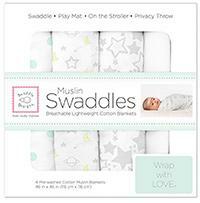 CuddleBug Muslin Swaddle Blankets. 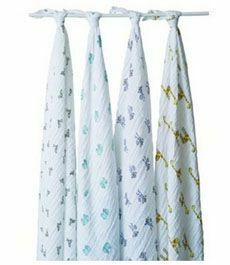 The CuddleBug Muslin swaddle blankets come in a ton of different colors and styles, ranging from adorable tropical-style "tutti frutti" designs with pastel colors and adorable little tropical fruits, to grayscale "starry nights" designs with subtle stars and dreamy patterns. These swaddle blankets are just under 4-feet square, coming in at 47" x 47", which matches the size of most others on this list. It's a really great size, the same as the larger Aden + Anais blankets, and leaves a little extra for smaller babies but gives enough to wrap even the bigger babies. And the quality and comfort are definitely present in these. We found the 100% muslin cotton very soft and a tiny bit stretchy, making for a great and slightly flexible swaddle wrap. The fabric is a bit thin, at least on the ones we tested (the "tutti frutti" one), making them perfect for spring, summer, and fall, but of course can be used for winter if baby is already wearing something a little warmer underneath. Like the other muslin swaddles on this list, after we washed them a few times they got even softer than they are out of the box. Of course, just like the others, it can be used as a stroller cover, nursing cover, receiving blanket, and many other uses. The market is quickly becoming saturated with awesome muslin swaddle blanket options, so it's becoming difficult to parse all the options. In this case, we believe that the critical distinctions are: these are not organic, whereas some of the higher ranked ones are. These also do not have the swaddling instructions stitched into the blanket like the SwaddleDesigns option. But, these are also a bit less expensive than the others, and they come in a ton of different styles to suit your personal preferences. So, if you're looking for an excellent and soft natural but non-organic swaddling blanket that is 100% muslin cotton, then this is an awesome option as long as the styles suit you! 6. 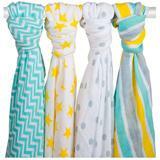 Zig Zag Kid Muslin Swaddle Blankets. The Zig Zag Kid swaddle blankets are a really excellent addition, and we got our hands on a set for our 2019 list. These are the same size as the above options, coming in at 47" x 47". They use gender-neutral color schemes that are great for girls and boys and make a great baby shower gift when you don't know what mom is going to have! And by the way, if that's your plan, these come in an adorable gift box. The premium lightweight 100% muslin cotton is soft, thin, and has a tiny bit of stretch. After a few washes, the quality of the fabric started to decline, especially the stitching around the edges. Though we didn't notice any shrinkage or color loss after washing. We think these are best for late spring, summer, and early fall swaddling. During the colder months, you will want a thicker option to keep baby warm. Overall, these are bright, comfortable, versatile blankets that are an excellent new addition to our list! 7. 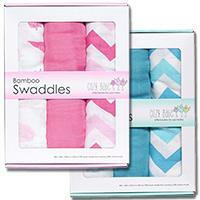 Cozy Babe Bamboo and Muslin Swaddles. These are a great new addition to the market, and we just got our hands on them for testing in mid 2017. They are a bit different from the other options on this list. These swaddles are not 100% cotton, or organic cotton; instead, they are made of 70% bamboo-derived rayon, and 30% muslin cotton. Second, they are quite a bit smaller than the others, measuring about 40" x 40". We found this to be a great size for smaller babies, and in our testing we thought it had surprisingly good coverage and flexibility to fit babies up to about 10 pounds or 23" tall. Bigger than that, and you're running out of blanket while wrapping. But this will probably cover a baby up to about 2.5-3 months of age, so that might be sufficient for your plans. And if so, there's some good reason to choose these blankets. First, they are really quite soft. Not nearly as good of a hand-feel as the higher options on this list, but still surprisingly soft, especially after washing. Second, they are quite a bit less expensive than many other swaddling blankets, coming in at around $8 to $9 per blanket for a 3-pack. By comparison, the Aden + Anais swaddle blankets are around $10 to $12 per blanket. Third, Cozy Baby is a small U.S. business, so you're supporting local entrepreneurs in their quest to make the perfect swaddling blanket. So why aren't they higher on our list? Well, as with all newer products on the market, we need ample time to evaluate longevity with prolonged use. Second, we're assuming the bamboo rayon is made using the viscose process, which involves the use of several harsh chemicals for solution spinning. We're not saying these chemicals remain in the blanket itself, but it's important to note that the recovery of these chemicals from the factories is only about 50%, which means the remainder goes into the environment (air, water, ground). So that's not ideal. Overall, however, this is a great option for those looking to save a little bit of cash and get a great, soft, swaddling blanket that comes in some really adorable patterns and colors. Let's be realistic. Swaddling has been done for centuries, even before the complex stitching of the Miracle Blanket or the invention of velcro. More traditional parents like the thought of simply using a blanket for swaddling! This is another versatile swaddling blanket option, a bit smaller than the others (42" x 42"), but certainly worth its cost. Though these are marketed as a receiving blanket, parents report loving these for swaddling. Moms report that these 100% cotton blankets are super soft (though a bit less so after a washing), and are made from a high quality and thick cotton. This is nice for those intermediate seasons, like Spring and Fall, when it's not quite warm enough for thin cotton, and not quite cold enough for micro-fleece. A couple additional advantages of this blanket: first, it is the only one on this list that is Made in right here in the USA. Second, we really appreciated how the instructions were sewn right into the edge of the blanket. No more fumbling around for instructions those first few times you use it. Just position it in a way that the instructions are easily available for reading, and you're off to the (swaddling) races! One drawback is that it's not the soft muslin cotton or bamboo-based rayon, and not quite as stretchy as the muslin, which makes it less than ideal for swaddling. The second drawback with this blanket is that it's a bit smaller in dimensions than the others, making it not ideal for swaddling a larger baby.